Five Steampunk Decor Items for Any Home! So, steampunk outfits, jewelry, costumes and movies just aren't enough, hm? I'll admit, steampunk's aesthetic can add a whole lot to a room with just an artful piece or two. And no- it doesn't have to be an airship or blimp hanging from your ceiling (because I can't imagine all spouses would be delighted by that idea). But, I'm here to share with you some gorgeous pieces that I think would be gorgeous in most homes! So, lets get looking, why don't we? Okay, initially I was going to put clocks. They're my favorite thing about the aesthetic (you may have noticed, and it's something simple to hang on the wall, with enough variety to match most existing themes. But then, I remember lamps. Because lamps, in my experience, don't have to match. They can, sure, match easily, if you take the time to pick them. But, I like to think that the leg lamp from the popular movie, A Christmas Story, proves that isn't necessary. Especially since I have personally seen more than one of those lamps in use. And lamps are so functional, they can be a conversation starter that doesn't involve the weather, if you get a unique and ornate one, or something that just adds to the atmosphere. The picture above is a really common style of Steampunk light, with the pipes and dials arranged in a variety of ways. This style would probably look best in a more rustic home, right at home with wood and darker tones of color. There are, however, lamps which appear more dainty, with different colors of metal, more glass fixtures and a narrower footprint, which could actually fit in most anywhere. Okay, be warned, for a lot of Steampunk themed wall clocks, you're going to have to figure out Roman Numerals. Which really, it's not that hard, but here in MMXVI, people have tended to lose the art of it. And it does make sense for Roman numerals to be used over the common Arabic, after all, we're after the time period, my friends. The clock above, one by Debbie Self, is an example for why clocks were my number one. There is no room that really couldn't have this in it. And there are so many versatile designs, numeral style, face style, size, gears inside, outside, that if one doesn't suit, there is no doubt in my mind you could find something to work. Nothing like a timepiece to bring you back to just the time you want to be in, after all. Okay, so storage isn't the most fantastically specific heading, but it's all that's needed. Bookshelves, chests of drawers, actual chests, containers. Many of these things come redesigned (or are DIY re-designable) in the steampunk style, and they make really amazing, unique pieces. They can be one major part to redoing a room into your preferred aesthetic. The picture above, I wish I know whose it was, is actually a combo of both. 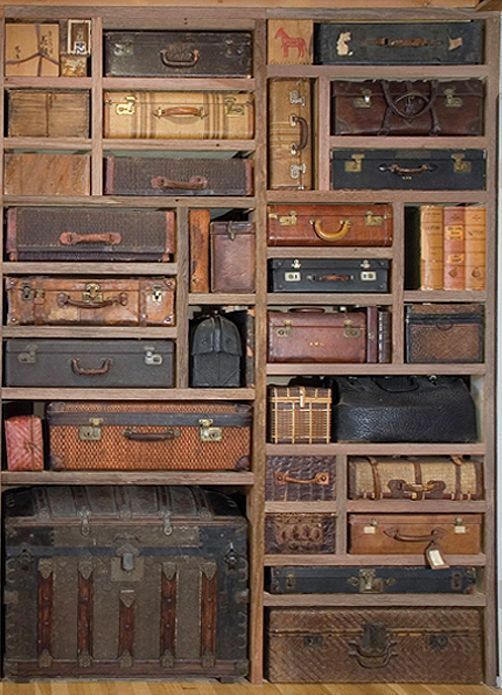 Older leather and cloth suitcases and trunks, clearly well worn and well traveled, on a perfectly divided shelf. It can be three dimensional art, or storage. Or, as I've seen before, replace the cases with drawers, made of reclaimed wood and various rustic knobs and drawer pulls, and it becomes a little more functional and absolutely personal and unique to you. Maybe this seems like a given, but clocks and paintings aren't the only things allowed on the walls. Steampunk wall art comes in co many different styles and types that even picking one to head the section was a nightmare. Some have animal themes, cog themes, portraits. Some are assemblage, some are laser or water cut metal pieces and others are framed prints. This is another place where the sky is the limit, and there is no doubt in my mind that someone on the internet has exactly what you need. 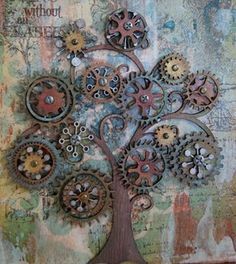 I'm rather a fan of the gear tree, slightly understated, but very unique. There are even vinyl gears that you can stick to your wall and make it look like there is more hiding behind the paint than just drywall. Pick your poison, go bold or subtle and sneaky, that's what make the room so custom to you. Maybe this is a hard one to find, because if you look for it on its own, you won't find much. But, a good leather sofa or chair, black or worn, rustic brown? That's exactly what you need. It's the tying in feature, so match the colors to everything else you may change, and a I recommend the tufted style, like above, with the button points that draw the leather tight. 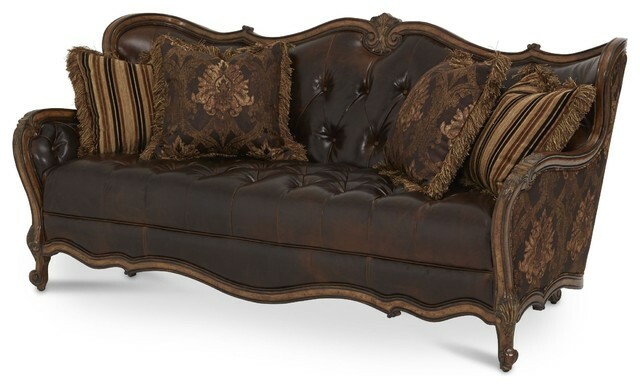 The one above is a bit of a Gothic Victorian style, with the dark stained wood accents alone the arms and back and the and black fabric for the pillows and back of the sofa. But, if you'd rather go with a modern style, a tufted sofa or chair is the perfect point to draw the modern luxury into the more antiquated parts of the design of the room. Have a modern designed leather sofa, and a gorgeous wall of antiquated leather suitcases, and let the contrast be your design. Well, that's all for now you guys, I hope you gleaned something useful from this article and have plans on making your home a beautiful steampunk-friendly little world of its own!